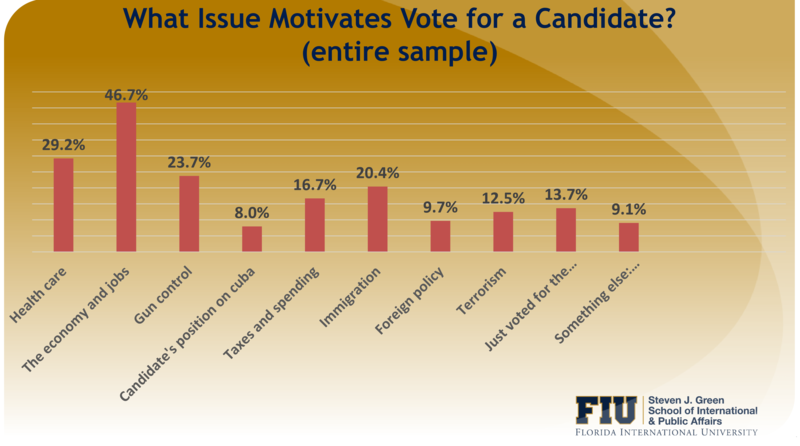 The annual poll of the Florida International University provides new insight about the growing political diversity in the Cuban community in the United States. 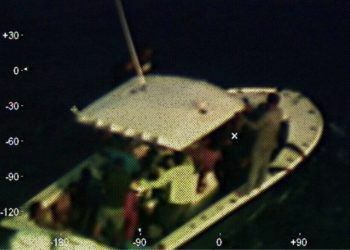 The so-called Guantánamo Generation has been the turning point in the reconfiguration of the Cuban-American community, diametrically altering its design since it settled in the south of Florida after 1995, according to a poll released last Thursday by the Florida International University on Cuban-Americans’ view on the Island. In almost all the polled categories, the new generations, particularly those who arrived in the United States after 1995, advocate a closer rapprochement with their native country or, at least, maintaining things as they are, although in electoral political terms they continue being inclined towards the conservative side. “The poll concluded that there are Cubans and Cubans,” one of its authors, professor of sociology and president of the Department of Global and Sociocultural Studies of the FIU, Guillermo Grenier, ironically said. 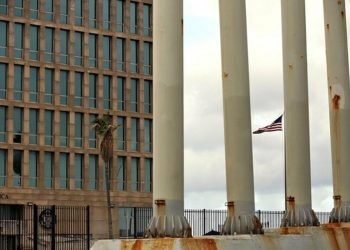 The study, known as the “FIU Cuba poll,” is titled “How Cuban-Americans in Miami view U.S. policies toward Cuba” and was carried out between last November 14 and December 1. One thousand and one Miami-Dade County residents were contacted by phone. The margin of error of the results is more or less 3.1%. 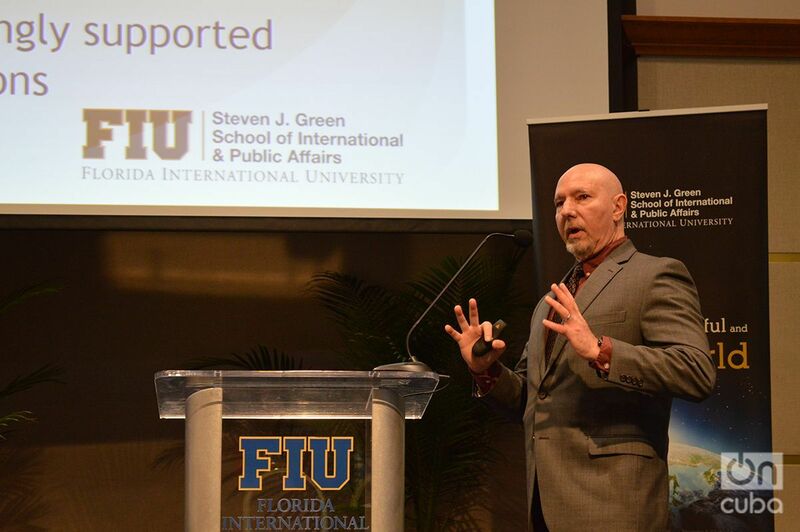 Dr. Guillermo Grenier, during the presentation of the poll on Cuba at FIU last Thursday, January 10, 2018. Photo: Marita Pérez Díaz. 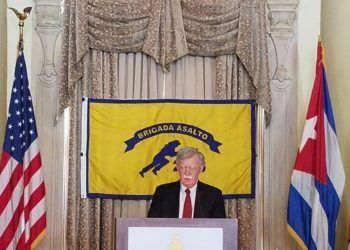 At a press conference, Grenier noted that the poll shows that with respect to how the United States should deal with Cuba, the Cuban-American community remains divided. Older people tend to identify with old policies and ways of thinking, while young people are more open to change. That is how the vast majority of those who have arrived since 1995, as well as the second and third generation, support a policy of developing links of all kinds with their country of origin. On the other hand, Cubans who arrived before 1980 – when the Mariel maritime bridge took place – advocate a more hostile policy toward Cuba. 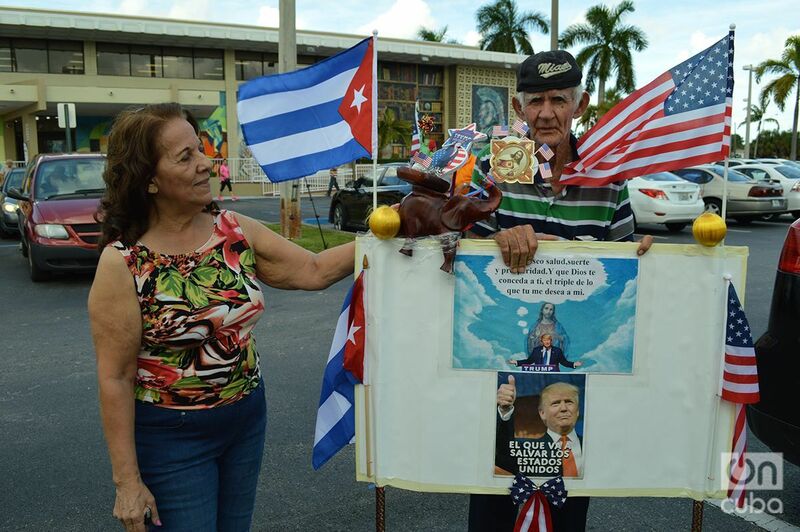 The arrival in the White House of President Donald Trump and his promises to roll back the opening policies of his predecessor, Barack Obama, have not substantially modified the trends regarding the political opinions of Cuban-Americans. They were already defined since the 2014 bilateral thaw. “In this we see a bit how the philosophy of the carrot and the stick continues. The old guard is against travel, for example. But Trump’s election did not change much the opinions (of the youngest ones) on the trips and people to people programs,” emphasized Grenier. Little Havana. Photo: Milena Recio. The position on Washington’s economic embargo on Havana is a clear example of this. In fact, the overwhelming majority, aged between 18 and 76, agrees with it: in these 60 years, the embargo has not worked at all. “It’s the only thing in which there are no nuances. There’s no doubt about that,” Grenier said. The first difference arises in relation to the existence of the embargo itself. 51% are in favor, 49% against. 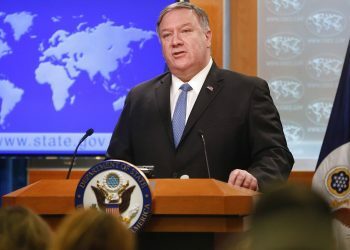 In this regard it should be noted that it is not a novelty because, except for the polls carried out in 2008, 2014 and 2016, when the majority of Cuban-Americans favored the lifting of the embargo, in the others since 1991 – when these studies started being carried out – support has prevailed for this measure of punishment by the U.S. government toward the island. The three exceptions have coincided with important electoral stages for the Democrats: the election and re-election of Obama and the duel between Trump and former Secretary of State Hillary Clinton. 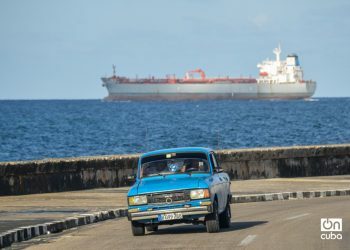 When the cut is made per year of arrival, this 2018 poll confirms that the Cubans who arrived after 1980 until 1994 favor the continuation of the embargo. But 60% of those who arrived after 1995 – the Guantánamo Generation – until now, believe that the economic embargo must end. And by age, the difference is greater. 65% of Cubans aged 18 to 39 want the end of the measure, the figure drops a little among those who are between 40 and 59 years old, because only 51% think this way. From that age range, the numbers shoot up in favor of maintaining the blockade. Older people want the continuation of this policy, with figures that go up from 60% to 73% from those aged 60 and more. The legendary Versailles. Photo: Milena Recio. Regarding the issue of freedom to travel to Cuba, that is, without restrictions for non-Cuban-Americans, 57% are in favor of lifting these restrictions, 43% against. In this area the opinion of the Guantánamo Generation is once again imposed when the cut is made per year of arrival. 68% of those who arrived after 1995 agree. However, 63% of those who arrived before 1980 and 51% between that year and the end of 1994 are against it. It is to be highlighted that the aging community is less flexible in this than the younger ones. By age the rejection is higher than 50% for those aged 60 and rises to 72% in those over 76. Since the Cuban exiles began flying more or less freely to their homeland in 1979, the subject of travel to Cuba was always controversial. The most conservative and belligerent sector of the exile was deeply opposed, there were clashes, bombs, deaths. Now the issue is no longer violent but it does not stop causing tensions. According to this Florida International University poll, 57% of respondents say they have never traveled to Cuba since leaving the island or their families did, because Cuban-Americans who have a special permit to travel should be taken into account. On the other hand, 43% affirm they have traveled. Again, among those who arrived after 1995, 75% have traveled at some time. But those who settled in the United States at an earlier date have not done so. 68% of those who arrived before 1980 and 51% of those who arrived from that date until the end of 1994 have never traveled. The figures are almost the same when the cut is made by ages. And this is also accompanied by the implementation of one of the liberalization measures signed by Obama, the issue of remittances. 60% say they have never sent remittances to Cuba while 40% say they have. In this area, the sending of money accounts for 40% of the remittances and 36% comprises merchandise in general. Again, in the cut by year of arrival most of the shipments came from those who arrived starting January 1995. “In all this, the least we can say is that the community is divided. There is a group that does not want a rapprochement or a change in the situation [with Cuba]. But there is another group that has relatives there and sees everything from the point of view of the need for contact with those relatives,” emphasized Grenier. Although the economic embargo on the island is a reality, its structure was fractured since the Bill Clinton administration signed the emergency aid package to the Caribbean that opened the doors to the sale of agricultural products. In a way, trade has flourished modestly and has evolved. From purchases in cash to sales on credit. In the last years of the Obama administration, with the bilateral thaw, dozens of consulting firms have appeared to advise hundreds of Americans who are studying how to enter, in some way, the Cuban market. Some have even been established with the expansion of the market and tourist services. Be they cruise ships, specialized travel agencies or, in the case of Cuban-Americans, in joint initiatives with relatives on the island. 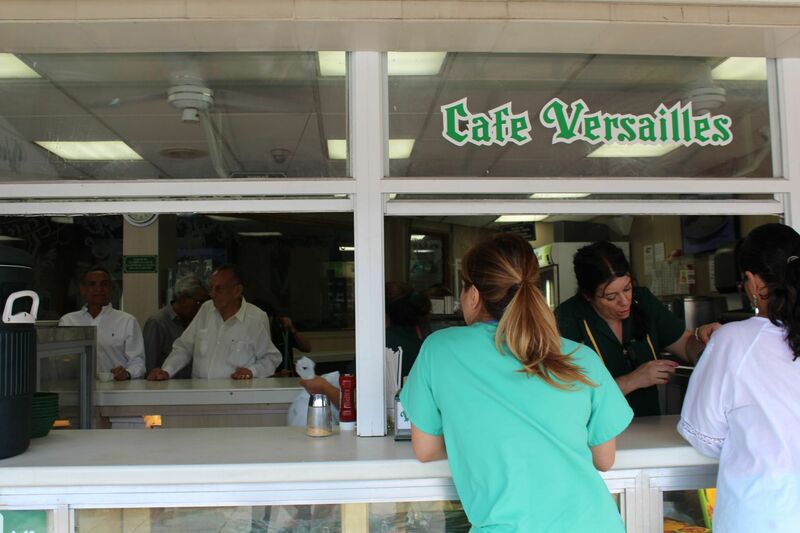 Therefore, the poll has tried to find out what the Cuban-Americans think about the issue. Should American companies expand their business deals with Cuba or simply abandon them? To begin with, 46% say that they have to be expanded, 32% that they stop them and 22% think that things have to be left as they are. Most of those who advocate the expansion came after 1980 and are less than 60 years old. Should the residents of the United States – of Cuban origin or not – receive permits to invest in businesses in Cuba? Understood as not being businesses owned by the Cuban government. In this the opinions are in general diametrically divided, 50% in favor, the remaining against. But by age and year of arrival, the youngest and those who arrived since 1995 tend to be overwhelmingly in favor. 63% of Cuban-Americans are in favor of the reestablishment of diplomatic relations. 52% support the end of the wet foot-dry foot policy, with 41% against and 8% don’t have an opinion on the matter. Among those who arrived from 1980 until 2018, more than 50% do not agree with the end of the wet foot-dry foot policy. A large number of them favored that policy created by former President Clinton and finalized by Obama. Trump doesn’t seem inclined to reactivate it. Cubans on Election Day in Miami. Photo: Marita Pérez Díaz. And how do Cuban-Americans vote? The position of a candidate with respect to Cuba is no longer a priority for the Cuban-American voters in Miami, but “they are concerned about the same problems as non-Cubans and other Latinos in the United States: health and the economy’s well-being,” the study also points out. It was revealed that when Cubans vote for a specific candidate, Cuba is ranked last on a list of 10 subjects. In descending order, for the Cuban voters the most relevant aspects that would make them vote would be: economy and work, health, arms control, immigration, taxes, voting for their party (regardless of priorities), terrorism, international politics, other priorities and, lastly, the candidate’s position with respect to Cuba. As for those who do place Cuba as one of their priorities for voting, the ages that reflect the greatest interest include people between 60 and 75 years of age. The tendencies of Cuban-Americans when deciding their vote indicate a strong tendency to be more concerned about local or national issues that directly affect them in their environment. 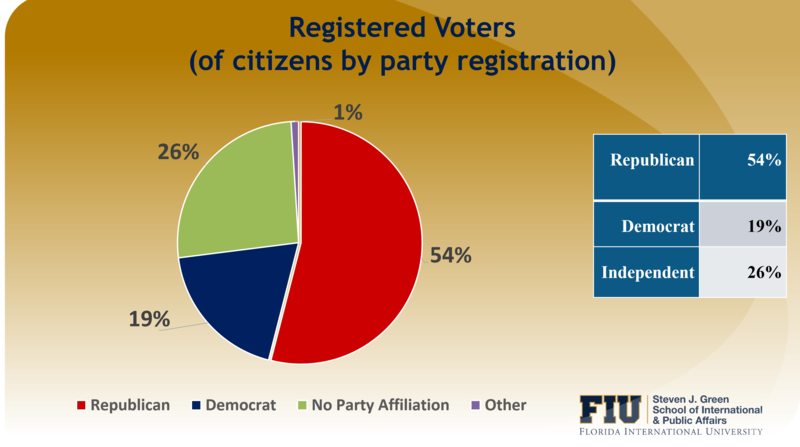 Republicans take most of the Cuban-American pie, according to the poll, with 54% registered to vote for that party, compared to 19% Democrat and 26% independent. 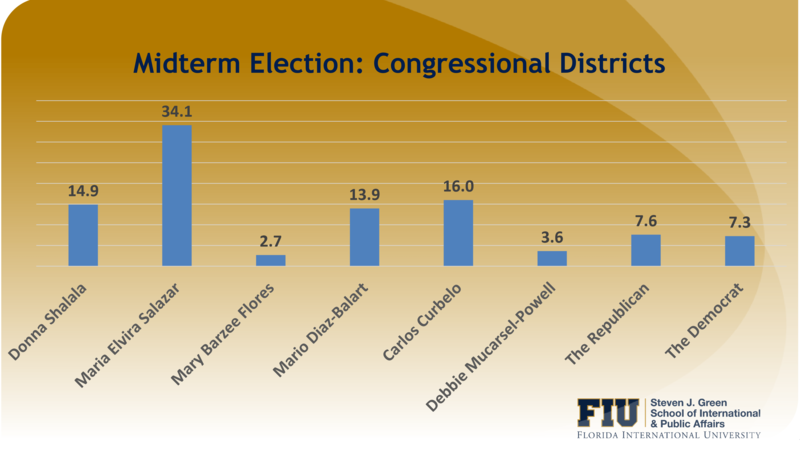 During the past midterm elections there were interesting results for the main candidates. 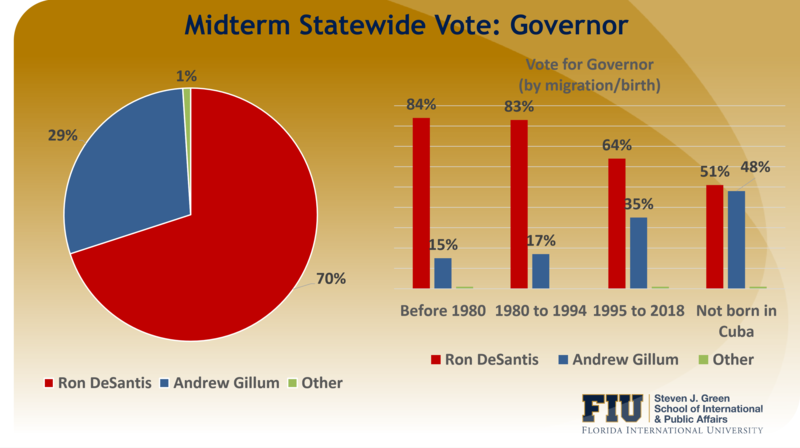 For example, 70 percent of the Cuban-Americans polled voted for current Republican Governor Ron DeSantis. However, divided by ages, the tendency toward a more divided vote is evident between Democrats and Republicans between the ages of 18 and 39. After 40 years, the vote is mostly Republican, reaching 90 percent among Cubans aged 76 and over. If one looks closely and divides by year of emigration and place of birth, those who arrived before 1980 voted in their majority for the Republican candidate, as well as the later migratory groups from 1980 to 1994 and then from 1995 to the present, where the margin decreases slightly. However, Cuban-Americans who were not born in Cuba had their vote technically divided with 51% for the Republican candidate and 48% for the Democrat. Likewise, the majority of respondents, 69%, voted for Republican Senator Rick Scott. In this case, the pattern of a higher Republican vote received by emigrants born in Cuba and a 50% tie for the two candidates for those who were not born on the island is also repeated. 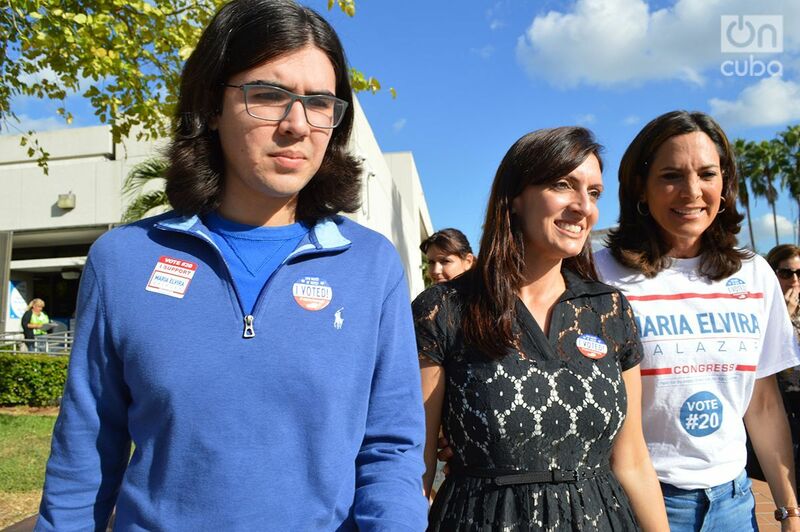 As for the elections for Congress of districts 25, 26 and 27, the numbers suggest that it is true that traditionally “Cubans vote Cuban.” The numbers favor in all cases the candidates of Cuban origin María Elvira Salazar, Carlos Curbelo and Mario Díaz-Balart. The first two lost in the race against their Democratic rivals. The group that most supported Democrats was that of second and third generation Cubans, as well as women. Another interesting fact is that, despite that the majority of Cuban-Americans follow a Republican voting pattern, the trend since 1997 (69%) is toward a reduction of registered voters for that party in 2018 (55%). Before choosing a candidate, Aranguiz checks her links with the NRA and the weapons lobby, and if he/she has any connection he/she is rejected for it. “I am also very interested in the topic of climate change and the conservation of the environment in general, so I would never vote for a candidate who does not support measures to preserve the environment and the moderate and sustainable use of resources,” said Aranguiz. However, although other issues weigh more for her, she does not fail to recognize that the view on the Cuba policy is among her motivations for choosing a candidate, no matter what his/her party is. “I’m interested in understanding the dynamics of the candidates in that sense. There are conservatives like Senator Flake who have always supported the rapprochement with Cuba. There are libertarians like Senator Ran Paul who also support the end of hostilities. So I’m aware of how they vote in Congress, beyond parties, with respect to Cuba,” she explained. In his opinion, “young people, Cubans or not, feel a general political apathy and that is sad, because we have seen the consequences in other countries when there is apathy towards politics,” he told OnCuba in November. Rey Anthony, 22, during a campaign event in favor of the Republican candidates in the midterm elections. Next to him, newly elected Lieutenant Governor Jeannette Nuñez and the candidate for Congress for the 27th district María Elvira Salazar. Photo: Marita Pérez Díaz. “Common people don’t have the right to buy and import products because of the regime, not because of the United States. We have lived 60 years of a dictatorship,” said Anthony, who was born in the United States and has never traveled to Cuba. 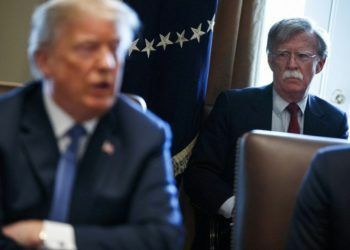 When pointing out contradictory elements of his discourse and how millions of Cubans are affected by the U.S. policy towards Cuba, he only reiterated his position. “That is not true,” he concluded. Another young woman born in Miami, Melissa Dominguez, 38, an immigration lawyer and daughter of Cubans, told OnCuba that she is registered to vote as an independent. “I vote for the person that I honestly think would be the best for the position for which he/she is running, regardless of the party,” she told OnCuba. “Many of my Cuban relatives and even some friends tend to think differently. In my experience, a lot of the Cuban community in Miami, including many of my relatives, tend to think more conservative than I do,” Dominguez explained about her personal experience. 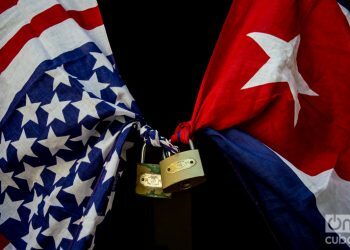 The survey did not reveal data on the opinion of Cubans about the Trump administration, since specific questions on the subject were not included. 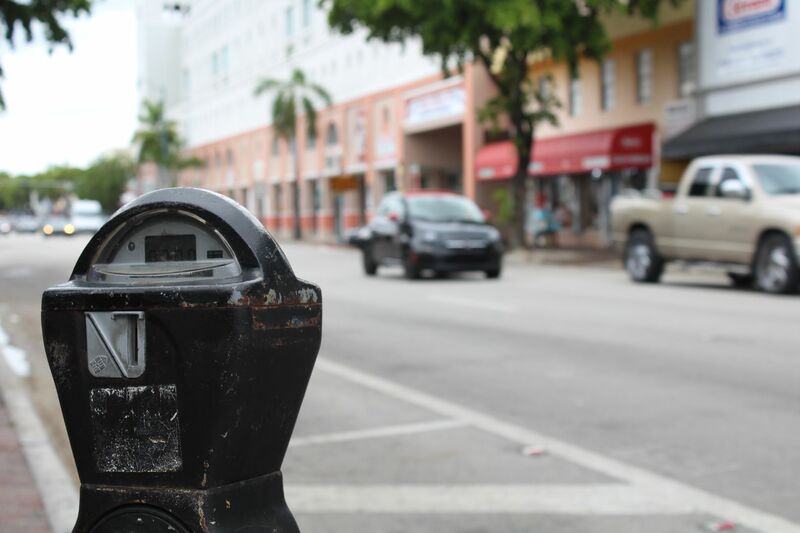 However, the Cuban Research Institute of the FIU published a tweet hours later specifying that the survey included the views of Cuban-Americans on the changes under the current presidency. 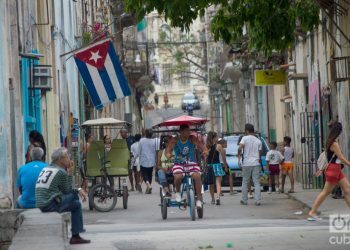 In the upcoming 2020 presidential elections part of the group of Cubans who arrived in the United States after 2013, after the Cuban immigration reform, will be able to vote for the first time. This means that the last wave of Cuban emigres, many of whom did not lose their residence in Cuba, will have electoral rights in both countries. What changes with this? How will it be reflected in Miami’s Cuban vote? Although the data is still non-existent, Guillermo Grenier told OnCuba that this is a segment that they will follow closely and that it is “very interesting” due to its ties with the island.